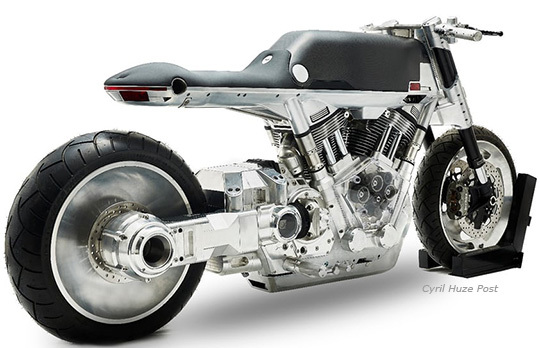 Vanguard is a new brand with a premium motorcycle designed and built in Brooklyn, NY. The company is led by renowned designer Edward Jacobs and serial entrepreneur Francois-Xavier Terny. They partnered a couple years ago with the intention of “ building, with a fresh perspective and unique approach, a premium motorcycle brand of revolutionary effect.” And you must admit that you never saw a motorcycle like that. The Roadster – to be officially unveiled at the NY Motorcycle Show – Dec 9 -11 at the Javits Center in Manhattan – demonstrates a lot of forward-thinking design and pioneering features without equivalent in the market. Jacobs and Terny intend to open new perspectives for the motorcycle industry and to bikers very unique models without equivalent. 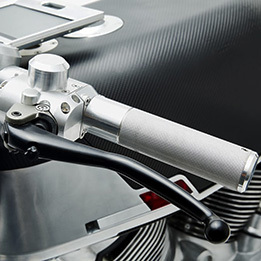 Vanguard will follow with a sportsbike and a cruiser built on the same powertrain platform. Designing the Roadster was done with a fresh approach, breaking everything down into rethinking needs and solutions. The result is a unique and striking contemporary silhouette blending form and function. The Roadster boasts many unique features including a frameless structural engine, unitized crankcase, integrated exhaust and a tablet-size digital dashboard with rear-view camera. 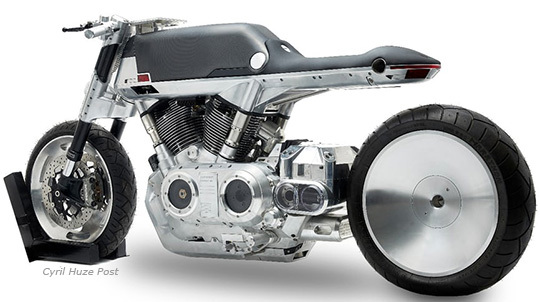 Vanguard motorcycles will be assembled in New York City at the Brooklyn Navy Yard with production of the Roadster stated to begin in 2018. Vanguard is looking for dealers to be ambassadors of the new brand and is already accepting direct pre-orders with price starting at $29,995. If you are interested, reach out to David Wax on my behalf. Looking like nothing else, only one Roadster’s major component is recognizable: the modified 117” (1917 cc) 56-degree S&S X-Wedge engine providing 110 pound-feet of torque and on which the Roadster is built around. For aesthetics and show, there is a clear cam cover letting you watch the belts spin. 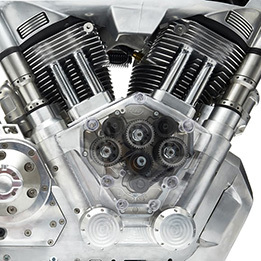 The bike subframe mounts directly off the engine, with the 3-gallon gas tank on top of it, looking like swallowing the cylinder heads. A slick color tablet replaces the dash, and transmit images shot from the rear view camera. A massive single sided swingarm hold the wide wheel dressed in 240 mm rubber. 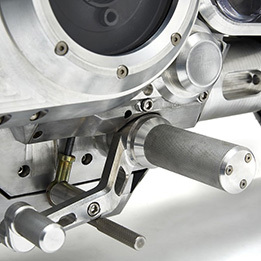 Ohlins provides the rear suspension with the system hidden in an aluminum box with top viewing window. 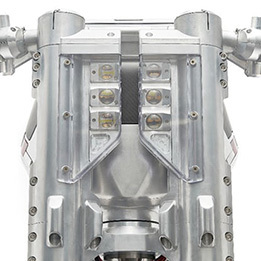 Inverted front end is also very unusual integrating a flat 6-led headlight. Brembo brakes are trusted to slow the Roadster. Although being almost entirely metal, the Roadster is surprisingly quite light at 550 lbs dry. Very interesting. But no possible way they will be able to offer that bike, street legal, for under $30K. Or is this a concept bike designed to be a teaser for the brand? Amazing bike. A new American brand. Yippee. A great new design. Yippee. Like nothing else and better than most. Bravo. Tank looks like a Rubbermaid container wrapped in vinyl. Seat is seriously lacking in imagination. Tablet looks like it was added on after the fact instead of integrated. A lot of it starting from the swingarm forward looks clunky… more like an 80’s Transformer than sophistication in modern machinery. Interested to see the final product though. Excellent design. My only critic is the 32″ high seat. Difficult for short guys. Brick City. I completely disagree with what you wrote. It’s a high tech bike. It got high tech lines and features and it’s a coherent design. Holy Mackerel ……………. that HAS to be the UGLIEST bike I have ever seen and my 11 year old could improve on that with his Lego Box. Premium Designers ???? Ehm – go back to the drawing board P L E A S E.
As for a “new American motorcycle” is born ………….surely it should say ANOTHER as VICTORY was born first and INDIAN is reborn. Dieter. You don’t like it because you are old. It’s not for you. Young guys with $$$ should love it. I applauded a new venture and guess accessories to come for real world riding? Right now it appears more for the young RUB. Way to go on the design. Confederate never sold more than 10 bikes a year. Vanguard will time this many times. People will love or hate it. I think it’s a very interesting motorcycle. I bet they will sell a couple of hundreds the 1st year. Don’t know if it’s enough to survive. I’ve followed Confederate since before Ed was a designer there. They sell and build at least 50 a year. Ed will never get this bike down to under $30,000. He should at least compete with Arch, as this is much more attractive than those! But building it to sell at $30k….??? People are buying 40K CVO’s and 30K Harley Ultras. High end mass produced sportbikes are selling up to 20K now. How is this any different if they can get it to 30K? I think thats a steal right right there, but if this is just a concept, imagine what a 30K production model would look like? To sum it up quite nicely . It looks like the south end of a north bound mule with a digestive problem after swallowing a closet full of tupperware . Hope they don’t get the chance to take their suppliers for a single cent. 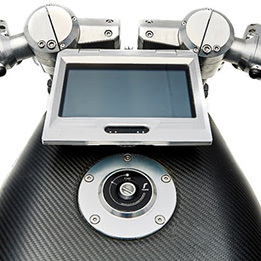 Interesting design for the tech savvy rider, but not my style at all. Confederate introduced this “genre” to a specific market more than twenty years ago, and they’ve held their ground, and ARCH has carved out a similar niche, so obviously there is a demand for this styling. The see through gear chest and other view ports look cool on an un-run machine, but I’m pretty sure they’re going to develop a layer of sludge from misting in no time at all. Whether this concept a “statement” or an actual EPA certified road machine will remain to be seen. I’m not sure how well the exhaust ported through the engine cases is going to serve a 117″ air cooled heat pump? All the heat has to go somewhere, and pumping it on to the back tire doesn’t seem to be the best idea in my mind. Hey Cyril, test ride the prototype and tell us what you think. Once it gets fenders on it will look like a Virago? 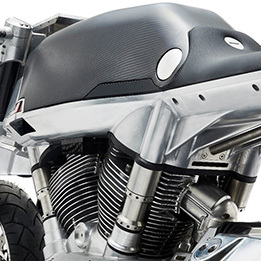 Has the market been begging for yet another V-Twin, but with a giant tongue for a seat? Good or bad it’s a motorcycle you can’t customize. Tough crowd here. Having hand built 3 motorcycles myself, I am very impressed by what they have shown us, if indeed they can offer it for sale at or under $30K. I’d like to hear more about their philosophy behind this bike — there were a few aspects of what we saw there in the photos that looked like more of a design statement than a commitment to function, performance and reliability; for instance: the use of plexiglas, which has some undesirable characteristics that I think these folks will come to understand. Either way, I’m glad to see some bold entrepreneurial steps forward in the manufactured motorcycle space. Hopefully these folks will show us what they can do with other materials like carbon fiber in the future — they certainly have a modern industrial mastery of aluminum. Interesting piece of engineering. There sure are a lot of twists and turns with the power transmission to be able to turn a driveshaft. I too am skeptical of the exhaust ducking into the shielding around the engine, but maybe they have some space shuttle heat shielding to keep it from making the engine too toasty. I do kind of dig the way they integrated the lighting into the forks to keep it clean. Time will tell if they can actually build it and meet the proposed price point. not something one would expect from ferrari or mclaren. the moto world is tough market to run in. a bike like this hasn’t a chance of market acceptance or survival. Sorry, just a confederate knock off. Copied their styling of the S&S motor etc. 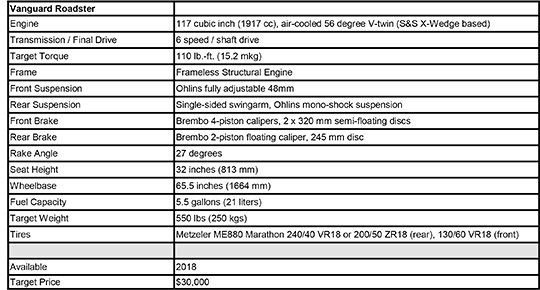 it will be very tough to be profitable at that price point unles the motor is an add on accessory. Some among you think that the company will not be able to retail this bike for 30K. But something you don’t know and that I suspect. The Roadster may have been engineered for a fast assembly with minimum labor cost. The second aspect is what is the market? Who, what age, what profile, etc. I am curious to know the demographics they are after. 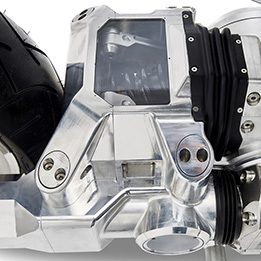 For the VMax-type of rider, this is a solid contender! 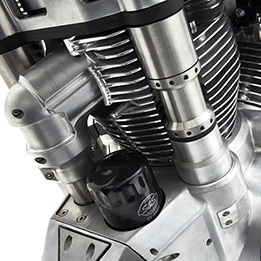 Consider the costs put into the VMax customs you’ve seen and this quickly becomes a great alternative. The motor is so massive it’s hard to get the wheelbase below 59″ but the VMax type of rider isn’t carving canyons with as much enthusiasm as a road racer or cafe racer rider. 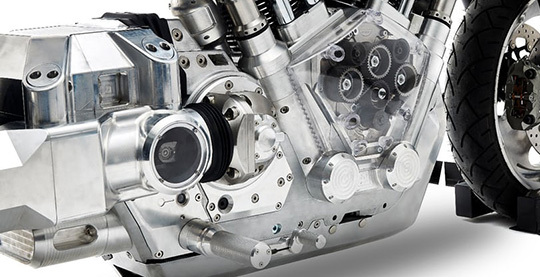 Which begs the question will they use this motor for their sportbike? 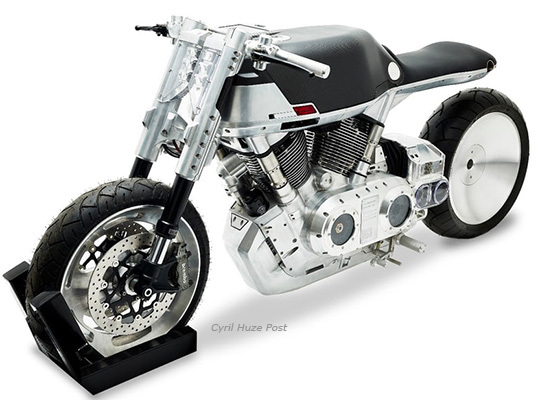 Looks Interesting, Where do you put the license plate without making it look like a. . .
Wow, If they build this Bike for $30 Grand or $35 Grand everyone will seen how much money Confederate over charges for their Generation II and Generation III Motorcycles. Mark J. Who said Confederate has been doing it Right for 25 Years? Do you meant they have been working hard seeking Investors for 25 Years. Little too fancy for my taste & too old to ride it ! But the workmanship looks top notch !! Again the trick is, does it appeal to the right niche, that has enough $$ to buy it ?? Interesting bike- I dig it. Not a chance in Hell they can sell it for $30K tho- prolly not even $60K- ask Arch how that works…..
Any body who steps up with their own design/concept deserves credit. In case everyone forgot it is called the Amican dream . Now that Ed has our attention with a super bike, how about make one we the people can afford. Oh wait maybe Trump should have given Ed the Millions of dollars in his local home town where people would like a job. Don’t miss understand me guys in Indy need jobs to . The model shown does not look like a street legal model. I can tell form the rear taillight it will not pass FSMS 108 regulatory requirements, or how about the exhaust DB requirement. 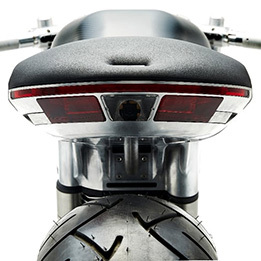 Not my kind of motorcycle but I dig the innovation and cool features, rear camera, clear cam cover, good luck to Vanguard!!! If the engineering has as a low degree of accuracy as the write-up, you’re in big trouble. Personally, I would not be a customer. Hand and foot-peg placement does not meet my riding style, and the price-point is beyond affordable for such a stripped down bike. No bags, no storage, no screen, no stereo, all of which are on competitor ‘mass’ production bikes in the same range. Only way it’s worth that price is if it’s a one-off collector’s piece.